This article is about the literary genre of letter-writing. For other uses, see Epistulae (disambiguation). An epistle (/ɪˈpɪsəl/; Greek: ἐπιστολή, epistolē, "letter") is a writing directed or sent to a person or group of people, usually an elegant and formal didactic letter. The epistle genre of letter-writing was common in ancient Egypt as part of the scribal-school writing curriculum. The letters in the New Testament from Apostles to Christians are usually referred to as epistles. 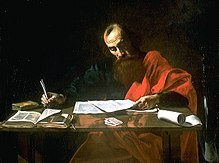 Those traditionally attributed to Paul are known as Pauline epistles and the others as catholic (i.e., "general") epistles. 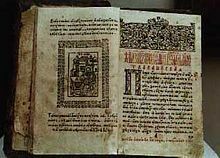 Epistles in prose and verse were a major genre of literature among the Greeks and particularly the Romans. The letters of Cicero are one of the most important sources on the history of the late Roman Republic and preserve features of colloquial Latin not always in evidence in his speeches and treatises. The letters of Pliny the Younger likewise are studied as both examples of Latin prose with self-conscious literary qualities and sources for historical information. Ovid produced three collections of verse epistles, composed in elegiac couplets: the Heroides, letters written in the person of legendary women to their absent lovers; and the Tristia and Ex Ponto, written in first person during the poet's exile. The epistles of Seneca, with their moral or philosophical ruminations, influenced later patristic writers. Epistles are written in strict accordance to formalized, Hellenistic tradition, especially the Pauline epistles. This reflects the amount of Hellenistic influence upon the epistle writers. Any deviancy is not the result of accident but indicates an unusual motive of the writer. In contrast to modern letters, epistles usually named the author at the very beginning, followed by the recipient (for example, see Philippians 1:1). The scribe (or more correctly, the amanuensis) who wrote down the letter may be named at the end of the episte (e.g., Romans 16:22). In the absence of a postal system, the courier may also be named (e.g. Ephesians 6:21–22). After the names of the author and recipient, Pauline epistles often open with the greeting, "Grace and peace to you." "Grace" was a common Hellenistic greeting, while "peace" (shalom) was the common Jewish greeting; this reflected Paul's dual identity in Jewish faith and Hellenistic culture. There may also be a word of thanks to the audience. In secular letters, a prayer or wish for health followed. The body begins with a brief statement introducing the main topic of the entire body. These are letters written by some very early Christian leaders, in the 1st or 2nd century, which are not part of the New Testament. They are generally considered to form part of the basis of Christian tradition. The ennobling word "epistle" is used partly because these were all written in Greek, in a time period close to when the epistles of the New Testament were written, and thus "epistle" lends additional weight of authority. In the context of a liturgy, epistle may refer more specifically to a particular passage from a New Testament epistle (the Pauline epistles and the General epistles)—sometimes also from the Book of Acts or the Revelation of John, but not the Four Gospels—that is scheduled to be read on a certain day or at a certain occasion. In the Roman Catholic Mass and Anglican Eucharist, epistles are read between the Collect and the Gospel reading. The corresponding Gregorian chants have a special tone (tonus epistolae). When the epistle is sung or chanted at Solemn Mass it is done so by the subdeacon. Epistles are also read by an Elder or Bishop in the Lutheran Divine Service, between the gradual and the Gospel. In the Divine Liturgy of the Eastern Orthodox Church and the Byzantine Rite Catholics the Epistle reading is called the Apostol (the same name is given to the lectionary from which it is read). The Apostol includes the Acts of the Apostles as well as the Epistles, but never the Apocalypse (Revelation of John). Unlike the Latin Rite there are never readings from the Old Testament. There are Epistle lessons for every day of the year, except for weekdays during Great Lent, when the Divine Liturgy is not celebrated. These daily Epistle readings are a part of the Paschal cycle, being ultimately dependent upon the date of Pascha (Easter). There are also lessons appointed for the feast days of numerous saints and commemorations. There may be one, two, or three readings from the Apostol during a single Liturgy. The Epistle is read between the Prokeimenon and the Alleluia. The Epistle reading is always linked to a reading from the Gospel, though some services, such as Matins, will have a Gospel lesson, but no Epistle. A number of services besides the Divine Liturgy will have an Epistle and Gospel reading. Such services often include a Prokeimenon and Alleluia as well. The Epistle is chanted by the reader, though at a Hierarchical Liturgy (a Divine Liturgy celebrated by a bishop), it is read by a deacon. The one who chants the Epistle also reads the verses of the Prokeimenon. During the Middle Ages, the art of letter writing was taught in numerous manuals, and the ars dictaminis became an important genre of instructional discourse. The necessity for letter writing was in large part due to the general deterioration of civil life and the decay of the Roman road system in the early Middle Ages, factors that obliged literate people with business to transact to send letters instead of travel themselves. A vast number of letters and letter-writing manuals were written in the period's lingua franca, Latin. ^ a b c Edward F. Wente (1990). Letters from Ancient Egypt: Society of Biblical Literature Writing from the Ancient World Series Volume 1. Translated by Edmund S. Meltzer. Atlanta, GA: Scholars Press. ISBN 978-1555404734. ^ Also called 2 Jude. Herbermann, Charles, ed. (1913). "Apostle (in Liturgy)" . Catholic Encyclopedia. New York: Robert Appleton Company. ^ Richardson, Malcolm (2007). "The Art dictaminis, the Formulary, and Medieval Epistolary Practice". In Poster, Carol; Mitchell, Linda C. Letter-Writing Manuals and Instruction from Antiquity to the Present: Historical and Bibliographic Studies. Columbia, SC: University of South Carolina Press. pp. 52–66. ISBN 978-1570036514. ^ Poster, Carol; Utz, Richard (2007). "Appendix B: A Bibliography of Medieval Latin Dictamen". In Poster, Carol; Mitchell, Linda C. Letter-Writing Manuals and Instruction from Antiquity to the Present: Historical and Bibliographic Studies. Columbia, SC: University of South Carolina Press. pp. 285–300. ISBN 978-1570036514. Look up epistle in Wiktionary, the free dictionary. Chisholm, Hugh, ed. (1911). "Epistle" . Encyclopædia Britannica (11th ed.). Cambridge University Press.